Think about an iceberg. Can you visualize it? Can you see the top? That’s your conscious mind and only about 10% of your mind or brain’s capacity. And can you also see the mass that’s hidden under the surface of the iceberg? Meet your subconscious and unconscious mind – that part of you that governs you 90% throughout your day. 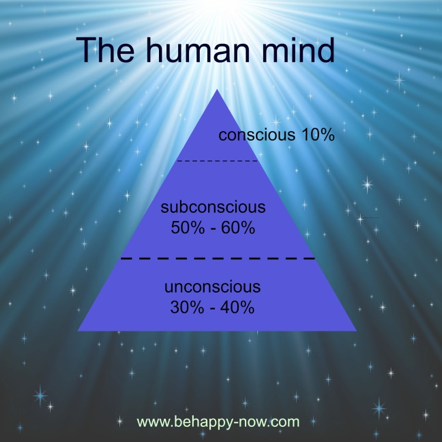 Or to put it differently: only 10% of the way you behave is governed by your conscious mind. So what happens with that 90%? It’s that part where your limiting beliefs are stored, your subconscious triggers, your traumas from this lifetime and others. It’s the part that shapes your personality. This is where history keeps repeating itself, as subconsciously we are all programmed to repeat faulty beliefs we hold about ourselves, or our parent’s story, and their parent’s stories. The information that you have stored in your subconscious mind will affect your behaviour and actions in different situations. Research was able to prove that we can carry our ancestor’s traumas within our DNA. The study of genes has been revolutionized by epigenetics. It could be proven that we not only inherit physical traits through our DNA but also behaviours and traumas that were felt generations ago, as well as negative emotions that are trapped and were passed on from generation to generation. There are scientific studies that have concluded that these traumas that were lived generations ago have much more power over our DNA than previously thought and can switch your own genes on and off. Our genes connect with the body’s neurochemical systems and can impact also other genes. Our brain has the power to shift and to create new neuronal pathways, which means that we have the power to shift the memory of our genes and our epigenetic emotional baggage permanently. What this means is that we might subconsciously be guided by fears, emotions, and behaviours that are not even our own. We carry traumas, trapped emotions and limiting beliefs from our ancestors deep within us. Our conscious mind doesn’t have enough power to create the life we want if sabotaged by the subconscious mind: it’s that simple.